It’s expected to cost a staggering $20,000 if it ever goes into production, and its battery can only power the device’s 36 fans for about six minutes. But unlike all the other hoverboards grabbing the media’s attention these days, Arca Space’s hoverboard actually hovers. The private space company—one of the 26 teams that competed for the Ansari X Prize back in 2004—isn’t exactly a household name. But a video it posted to its YouTube channel this morning showing off the company’s functional ArcaBoard hoverboard could soon change that. Instead of somehow cheating physics and gravity using a clever scientific breakthrough, the ArcaBoard takes the brute force approach to lifting the platform and a rider almost a foot off the ground using 36 electric fans to generating 430 pounds of downward thrust. That’s why the ride time is currently an abysmal six minutes. The 272 horsepower generated by those 36 fans chews through a lot of power, and you can only pack so many batteries inside the ArcaBoard before the platform gets too heavy to lift itself, never mind a passenger. Riding the ArcaBoard looks even trickier than mastering those two-wheeled imposters that are all the rage now, but that’s not stopping from Arca Space from letting anyone pre-order its hoverboard for $19,900 with a promised delivery of April of next year. Expect that to come with a safety waiver or ten you’ll need to sign before delivery. 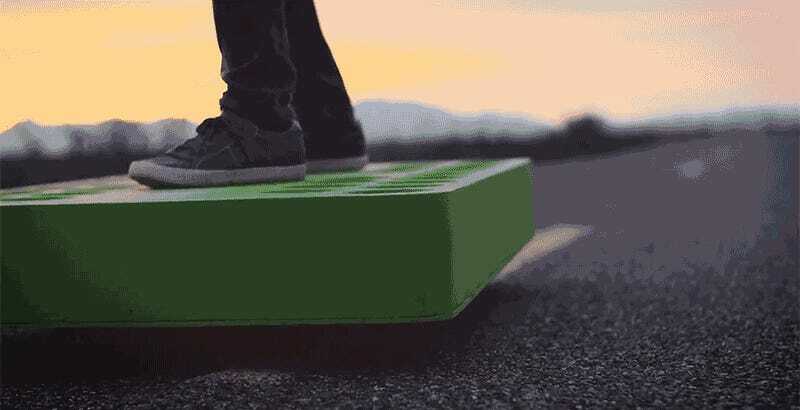 To get around the ArcaBoard’s limited flight time, which requires a six-hour charge in-between your hovering adventures, the company has also developed a $4,500 dock accessory that reduces your hoverwaits to a mere 35 minutes of charge time. In other words, it’s pretty much a must-have accessory if you want to hover for more than 24 minutes every day.